We’ll email you the claim form after your delivery. Just fill it in within 21 days and we’ll transfer the money directly to your account. Experience amazing all-round performance with this Surface laptop 2 from Microsoft. The sleek lightweight design makes it easy to carry to and from meetings, while the 14.5 hour battery life means you’re not constantly tied down to your desk. Plus, it offers effortless control, thanks to the Full HD+ touchscreen, which can also double as a superb movie screen when you want to wind down. You’ll also enjoy amazing load times as well as plenty of storage to save your documents and photos with the 128GB solid state drive. And, it’s all powered by an 8th gen Intel® Core™ i5 processor, which is paired with 8GB of RAM for seamless multitasking. Don’t forget to grab a copy of Microsoft Office and an antivirus package to keep your laptop protected online. When you choose Microsoft, you can have total confidence in your purchase. Microsoft bring those familiar features that you know and love and combine them with innovative new benefits – so you’ll really get the most out of every use. Merging great usability, security and compatibility, Microsoft are a great choice for every type of PC user. The Surface Laptop is a seriously attractive bit of kit. The sleek, lightweight design features an elegant blend of texture and subtle details, with suave, clean lines, and not a single screw in sight. With 4 elegant colours available, you can complement your own style while still maintaining a classy, professional look. The Surface Laptop balances desktop power with a light, compact design to create the ultimate laptop. The marriage of powerhouse performance and stylish portability means you’ll be fully equipped wherever inspiration strikes. Whether you’re travelling by train or camped out in the café, you’ll always be able to get the job done. The vibrant, 13.5 inch PixelSense™ touchscreen gives you more space for your ideas, with an edge-to-edge display and ultra-thin bezel. Plus, the touchscreen allows you to swipe, tap and scroll through web pages, games and more. Using your device has never been so simple or felt so natural. The Surface Laptop’s amazing range of accessories ensure you’ve always got the right tool for any job. The Arc Mouse is the perfect wireless companion to make navigating through tasks simple. The Surface Pen lets you doodle and annotate with ease, and the Surface Dial lets you move through menus with one hand so that you can draw with the other. With each accessory, you’ll be able to use your device more efficiently than ever before. Windows 10 is the new operating system by Microsoft. It’s packed with brilliant features to help you be more productive, and have more fun! Its super-safe thanks to built-in security and updates, and, if your device is compatible, you can log-in with facial recognition thanks to Windows Hello. Windows 10 also as a speedy Microsoft web browser, and Cortana – your personal virtual assistant. Thanks to Windows Hello, you’ll never have to remember another password. Using clever facial and fingerprint recognition, you can effortlessly log into your devices – whilst ensuring your laptop stays totally secure. Windows Hello offers super-safe access, as each log-in is personal to you – your face, your iris, your fingerprint. So you can rest assured that your data and details are well protected. Cortana is designed to make your life easier. She can perform all sorts of tasks like managing your calendar, tracking parcels, finding files and even telling jokes! Simply type your question or request directly into your laptop or just ask Cortana to help you. Voice activation technology means that Cortana recognises your voice and responds to you right away – she’ll even keep you up to date with your interests, favourite places and the weather. Antivirus software is essential. It doesn’t come loaded on your device, so you’ll need to buy it separately. It will protect your desktop, laptop or smartphone from nasty online threats like malware, spyware and viruses – which can all affect your computer in different ways. Antiviruses help keep your details and transactions safe too – so you can shop online with confidence. What’s more, many come with parental controls which are perfect if your family like to browse the internet. We stock both McAfee and Norton packages, so you can choose the perfect antivirus for you. Great screen, very light and good battery life. 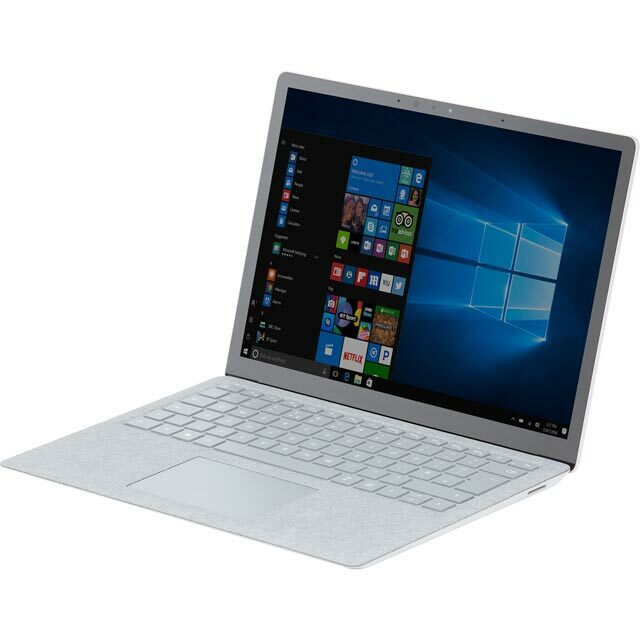 Was looking for an ultrabook type laptop which was portable, fast and good for document work - this totally fits the bill. I bought this laptop a few months ago for my new job and I can't say enough about how great it is. Having had Toshiba and HP laptops before, the Microsoft Surface is a step up in so many ways. Not only is the build/design quite sleek but it's light and high-performing. The keyboard is excellent to type on and the touch screen is great and a nice option if you don't want to use the mouse. I also love the look and feel of the fabric surrounding the keyboard. In terms of performance, I use this laptop everyday for work and it runs incredibly well even with multiple screens and processes going at once. I bought the version with 128GB storage and 8G RAM and have not suffered from any storage or speed issues. The only downside to this laptop is its lack of ports. There is only 1 USB drive and ideally it would be great to have 2. But for my purposes this doesn't hinder me too much. For anyone looking for a beautiful, lightweight quality-built laptop, I highly recommend the Microsoft Surface 2 series. I love this laptop, the touch screen is brilliant and I really like the smooth velvety soft material on the keyboard which makes the whole experience of using the laptop very nice indeed! One feature I do like is the magnetic charging port, so if you catch the lead it comes out easily and won't pull the laptop off the table. I find the size of this laptop a perfect size for taking with you to work or to the coffee shop etc! The laptop is very thin and with the nice smooth aluminium case it quite often gets mistaken for a certain other "fruit" branded laptop! Overall i'm very happy with this laptop, I don't do anything to major with it I only really use it for the usual internet purposes but it is plenty powerful enough should I need a bit more out of it! One thing I do not like is the power lead is shorter than others I've had but the power brick does have a usb charging port built into it. * LQL-00003 was at the higher price between 21/03/2019 and 17/04/2019.